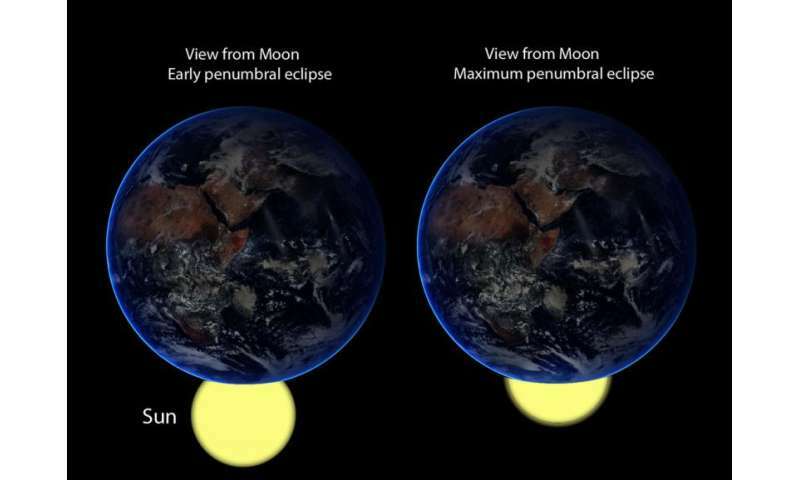 Not many people get excited about a penumbral eclipse, but when it's a deep one and the only lunar eclipse visible in North America this year, it's worth a closer look. What's more, this Friday's eclipse happens during convenient, early-evening viewing hours. No getting up in the raw hours before dawn. 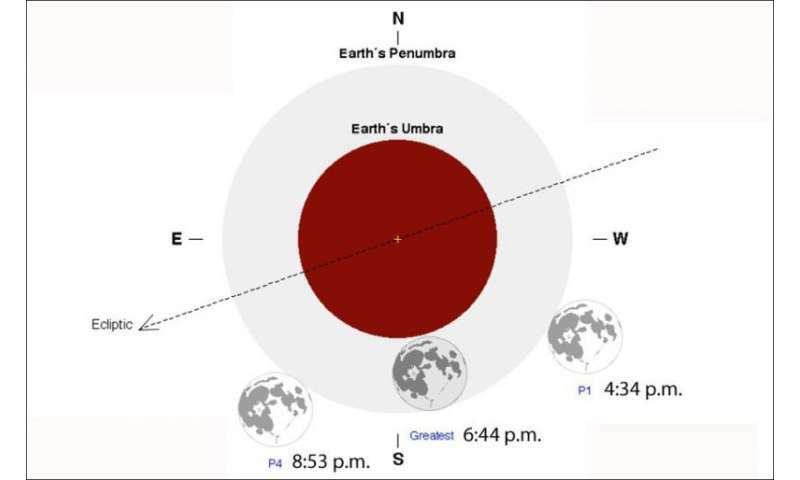 During a partial or total lunar eclipse, the full moon passes first through the Earth's outer shadow, called the penumbra, before entering the dark, interior shadow or umbra. The penumbra is nowhere near as dark as the inner shadow because varying amounts of direct sunlight filter into it, diluting its duskiness. To better understand this, picture yourself watching the eclipse from the center of the moon's disk (latitude 0°, longitude 0°). As you look past the Earth toward the sun, you would see the sun gradually covered or eclipsed by the Earth. Less sunlight would be available to illuminate the moon, so your friends back on Earth would notice a gradual dimming of the moon, very subtle at first but becoming more noticeable as the eclipse progressed. As the moon's leading edge approached the penumbra-umbra border, the sun would narrow to a glaring sliver along Earth's limb for our lucky lunar observer. Back on Earth, we'd notice that the part of the moon closest to the umbra looked strangely gray and dusky, but the entire lunar disk would still be plainly visible. That's what we'll see during Friday's eclipse. The moon will slide right up to the umbra and then roll by, never dipping its toes in its dark waters. During a partial eclipse, the moon keeps going into the umbra, where the sun is completely blocked from view save for dash of red light refracted by the Earth's atmosphere into what would otherwise be an inky black shadow. This eclipse, the moon only flirts with the umbra. 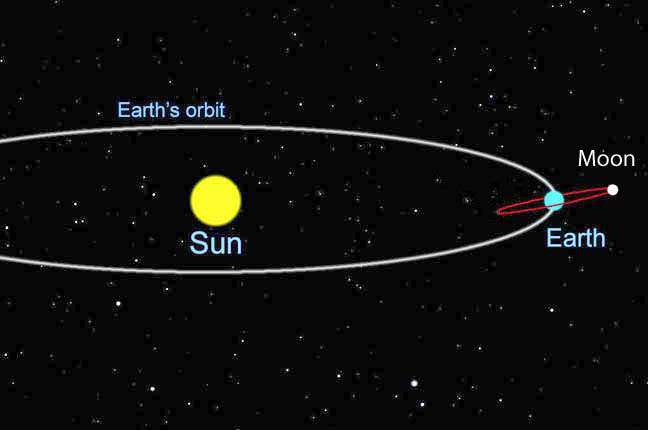 Because the moon's orbit is tilted about 5° from the plane of Earth's orbit, it rarely lines up for a perfect bullseye total eclipse: sun – Earth – moon in a straight line in that order. 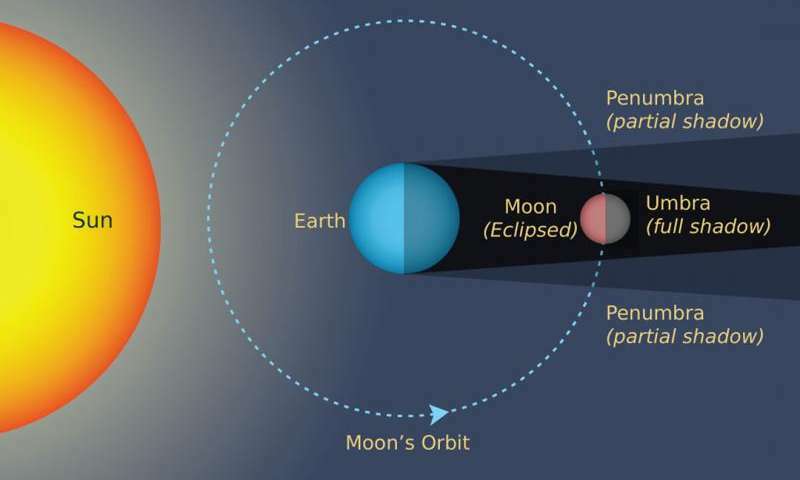 Instead, the moon typically passes a little above or below (north or south) of the small, circle-shaped shadow cast by our planet, and no eclipse occurs. Or it clips the outer edge of the shadow and we see—you guessed it—a penumbral eclipse. Earth's shadow varies in size depending where you are in it. Standing on the ground during twilight, it can grow to cover the entire sky, but at the moon's distance of 239,000 miles, the combined penumbra and umbra span just 2.5° of sky or about the width of your thumb held at arm's length. Because the moon travels right up to the umbra during Friday's eclipse, it will be well worth watching.The lower left or eastern half of the moon will appear obviously gray and blunted especially around maximum eclipse as it rises in the eastern sky that Friday evening over North and South America. I should mention here that the event is also visible from Europe, Africa, S. America and much of Asia. For the U.S., the eastern half of the country gets the best views. Here are CST and UT times for the different stages. To convert from CST, add an hour for Eastern, subtract one hour for Mountain and two hours for Pacific times. UT stands for Universal Time, which is essentially the same as Greenwich or "London" Time except when Daylight Saving Time is in effect. You can see that the eclipse plays out over more than 4 hours, though I don't expect most of us will either be able or would want to devote that much time. Instead, give it an hour or so when the moon is maximally in shadow from 6 to 7:30 p.m. CST; 7-8:30 EST; 5-6:30 p.m. MST and around moonrise Pacific time.